The major feature film which will be shooting up in Ullapool in October. We had a hugely successful day casting Extra’s in Ullapool last month, the director now wants to shoot more in the ullapool area and wants to increase the number of extra’s used. So we are now looking for more extra’s to appear in the film in addition to those who have been cast already. We are looking for around 50 more men aged between 16- 45, who have slim physiques and are physically fit. We are also looking for 10 older men and women, aged between 50-90 years old and young women aged between 16-25 years old who would play tribal princesses. This expansion of the Ullapool cast is an exciting development, and we would really like to go with real people from local area’s rather going through the usual means. Hopefully you may be able to circulate this information in the Ullapool News. We are inviting people who are interested in the opportunity to email a photograph (headshot and full length) and contact details to lara@deshamilton.com or myself. We will then be in touch to arrange a casting. If you have got any questions regarding this then please do not hesitate to contact me on the number below. Thanks again for all your assistance publicising the last day of casting in Ullapool, we had a great day. ‘Aromathon’ will be from the 19th October beginning in Ullapool and ending in Lockerbie on the 23rd October. The route has been confirmed also as Ullapool, Dingwall (19th), Inverness(20th), Invergarry(20th), Fort William(21st), Oban(21st), Crianlarich(21st), Biggar(22nd), Moffat(22nd) then Lockerbie (23rd). Tickets cost of 10.00 each for the chance to win a full body aromatherapy massage with one winner receiving their massage in their nearest town on route on the specified dates. I will also be raising money through sponsorship of the event for which Rokpa will be supplying all of the official paperwork and all proceeds will be donated to Rokpa. In addition to the 5 concerts, which will all take place in the MacPhail Centre and 3 festival clubs which will all take place in the Arch Inn ( this year the late club will take place in the downstairs bar so more room to spread out).The trade show will take place in the Foyer of the MacPhail centre, with Elixir Strings, Fylde, Moon ,Powell and Avalon guitars displaying and selling some of their fabulous instruments( most guitars heavily discounted!!!) It’s all very tempting!!!! The Ullapool Guitar festival takes place over a weekend in October. This years event has workshops, Free music sessions and concerts so why not book your holiday to Ullapool to concide with the guitar festival. The first Ullapool Guitar Festival took place in 2000 and its each year its bigger and better than the last its now made its mark on the highland festival circuit and a great event to be around for all the family. Website for the Programme Schedule of who’s playing and ticket deals. 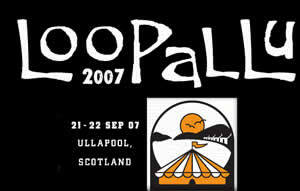 Following the success of the festival in previous years, Loopallu returns to the shores of Loch Broom in Ullapool from 21-22 Sept 07. Shanti Griha, means House of Peace. This Retreat Centre is on Scoraig a secluded peninsula west of Ullapool. Shanti Girha is set in two acres of magic garden, at the foot of Ben Ghobhlach 300 yards from the seashore. Spending time at Shanti Griha is like going back in time to a slower, more leisurely lifestyle. WildTiles Courses or Travelling Workshops. 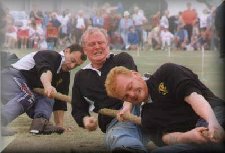 The Highland Games is a great gathering of local people and visitors with plenty to do and see. Get a real traditional Scottish feel. 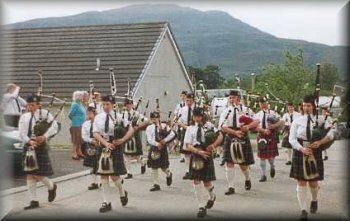 While in Ullapool the performances through out the summer months of The Pipe band and Highland Dancers are a must see. Parading through the streets finally coming to a stand still in the large Car Park near the pier where the Highland Dancers take center “stage”.